Rupert Murdoch just drove the final nail into his News of the World coffin, shoving it unceremoniously out to sea like a recently deceased Al Qaeda boss. Its editor Rebekah Brooks gets to keep her post as chief executive of all News International while its reporters mill around outside of the building, levying vague threats. It’s fair to say good riddance, and rejoice that a newspaper that hacked 4,000 and bribed £100,000 will soon be moldering in the trash heap. But the fall of News of the World isn’t all good news. In fact, it could do a lot of damage to the tabloid’s more dignified News Corps neighbor at 3 Thomas More Square: England’s thunderer, The Times of London. The closure of Murdoch’s cash cow will make it much harder for him to prop up his legitimate outlet, a paper with fine journalism, but little money. The Times (full disclosure: I have worked there) has long been considered the UK’s newspaper of record. Walk a few yards (or meters) from the Sun’s Page Three girls and the NoTW’s Nazi hookers and you’ll find yourself in the land of Kipling and Russell, a paper which broke key WikiLeaks stories last summer and uncovered the recent World Cup bribing scandal. But the staid newspaper hemorrhages money. The Times and Sunday Times lost £87.7 million in 2009 and £50.2 million in 2008. Murdoch bought The Times as a prestige paper in 1981 for tens of millions, and as he puts it, “[My] only paper that’s in loss is the London Times. And that’s always been the case.” To his credit, the paper might have failed otherwise. 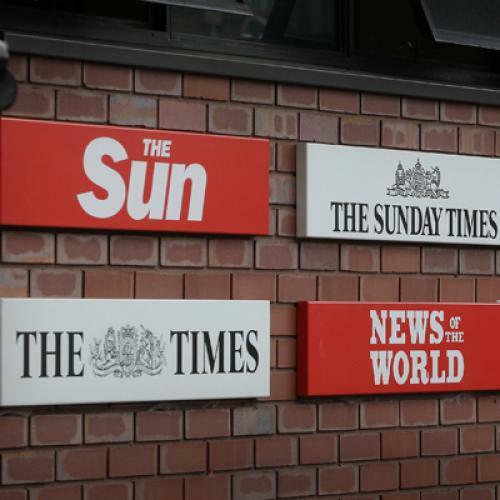 The Times is still a loss leader with half a million or so readers, propped up by the gangbuster revenues of other News Corps outlets like the Sun and News of the World, which boast about 2 and a half million readers apiece. News of the World alone makes over £150 million a year in sales and ads. With that revenue stream gone, News Corps papers are going to come under a lot of pressure. We’re going to see the expansion of the odious Sun (read: thesunonsunday.co.uk). Worse, the company has already announced it will move The Times and Sunday Times to seven-day working. Given Murdoch’s uncanny bottom-lining ability to turn news into a sideshow, there’s good reason to fear that a lot of what makes The Times great is about to come under the chopping block. Last summer, the paper lost 60 staffers amid budget cuts. Not all British journalism is bad. The problem is, one of its best parts has found itself chained to one of its worst, thanks to the encircling grip of the Murdoch conglomerate. News of the World deserves to go down the drain — but it might pull down some good journalists along with it.